Martha Elizabeth Ward, author, poet, and bhakta, was born July 17, 1960, in Amarillo, Texas, and died Wednesday, August 20, 2014, in Gaithersburg, Maryland, of natural causes following a long illness. She graduated from Amarillo High School in 1978 and was awarded a Bachelor of Science degree in Medical Records with honors from Southwest Texas University in San Marcos in 1982. She lived in the Dallas area for many years, working in positions such as Director of Medical Records, and medical records quality auditor for the State of Texas. She had two children, Jennifer and Michael. Disabled by a botched operation in 1997 that left her with a chronic pain condition, she took up residence in the Shivayogi Ashram with her guru Professor Emeritus G. V. Desani, noted author and spiritual teacher, and Ray Ward, her husband-to-be and GVD’s personal editor. She managed the Professor’s aides, and learned about Theravada Buddhism, mindfulness exercises, and Bhakti yoga. She loved living in a literary household, her writing and music, and being able to spoil her children. She died as she had hoped, in the arms of her loving husband, surrounded by friends, and the sounds of a baby’s laughter. 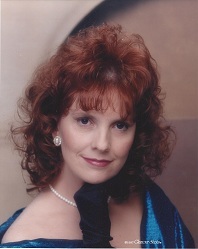 She is survived by her husband, Ray Randall Ward; the son whom she loved above all, Michael Lee Felton; her dear brother, Michael Eugene Hudson and his wife Kathy; their daughters, Channa Foster and her son Gideon Foster, her goddaughter Danielle, Callie, and Cate; her parents Clyde Milton Hudson, Mary LaVonne Riley Hudson; her estranged daughter Jennifer Elizabeth Felton-Woods-Lingner and her husband Ryan, and her four grandsons, Michael and Gabriel Woods, Asher and Grayson Lingner. She was an organ donor, and her skin was donated for reconstructive surgeries. Her remains were cremated and will eventually be scattered at sea, according to her wishes. A memorial service will be scheduled sometime next year. Her full obituary will be published on her blog, iamdying.net, and posted on her Facebook page, facebook.com/elizabeth.hudsonward . This entry was posted on 2015-11-07 at 13:49 and is filed under Bhakti, Dying. You can follow any responses to this entry through the RSS 2.0 feed. Responses are currently closed, but you can trackback from your own site.